Original publication date: Monday June 30, 2003. An X-ray movie of the Vela pulsar, made from a series of observations by NASA's Chandra X-ray Observatory, reveals a spectacularly erratic jet that varies in a way never seen before. The jet of high-energy particles whips about like an untended firehose at about half the speed of light. 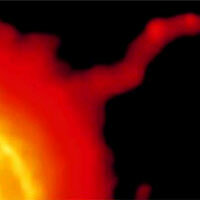 This behavior gives scientists new insight into the nature of jets from pulsars and black holes. Chandra observed the Vela pulsar, a rotating neutron star, 13 times between January 2000 and August 2002. These observations, which were designed to study the nature of the outflow of matter and antimatter from the pulsar led to the discovery that an outer jet of particles was bending and moving sideways at phenomenal speeds. "This jet is half a light year in length, and is shooting out ahead of the moving pulsar," said George Pavlov of Pennsylvania State University in University Park, lead author of a paper in the July 10th issue of The Astrophysical Journal. "The most striking thing about this jet is how rapidly it changes both its shape and brightness. Such strong, fast variability has never been observed in astrophysical jets." The time-lapse movie shows that in a matter of weeks the jet changes from being straight to hook-shaped, while bright blobs move along the jet at about half the speed of light. The jet is composed of extremely high-energy electrons or positrons (an antimatter form of electrons) that are spiraling around a magnetic field. The particles in the jet are created and accelerated by voltages 100 million times that of a lightning bolt. These voltages produced by the combined action of the fast rotation of the neutron star and its intense magnetic field. Over its entire length, the width of the jet remains approximately constant. This suggests that the jet is confined by magnetic fields generated by electrons flowing along the axis of the jet. Laboratory studies of jets or beams have shown that they can change rapidly due to an effect called the "firehose instability." "Imagine a firehose lying on the ground," said Marcus Teter, also of Penn State and co-author on the paper. "After you turn on the water, you will see different parts of the hose kinking up, and moving rapidly in different directions, pushed by the increased pressure at the bends in the hose. The Vela jet resembles a hose made of magnetic fields, which confines the electrically charged particles." The instability could be triggered by the strong head-wind created as the pulsar moves through the surrounding gas at a speed of 300,000 kilometer per hour (about 200,000 miles per hour). The bright blobs in the jet are thought to be a manifestation of the increased magnetic field and particle pressure at the kinks in the jet. The observed brightness of the outer jet and the rapid motions of the jet and blobs in it indicate that the bright arcs around the pulsar may not be rings circling its equator, as previously thought. Instead, they may represent shock waves caused by the motion of the inner jet through the cloud of particles around the pulsar. "The study of pulsar jets is important not only in itself," said Oleg Kargaltsev, a Penn State graduate student and co-investigator, "but it could also help to understand the nature of the enormous jets coming from supermassive black holes. Those jets may also vary, but on time scales of millions of years, instead of weeks as in the Vela pulsar jet."